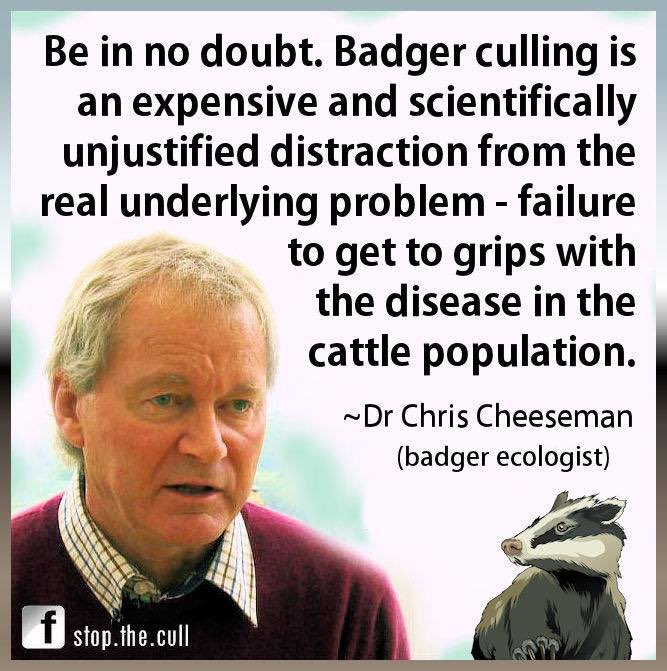 Listen to Chris Cheeseman talk about badgers and the culls. Chris Cheeseman studied zoology at Southampton University and then went to Africa to study small mammal ecology in Ruwenzori National Park, Uganda for his PhD. He subsequently specialised in research on zoonotic diseases, including rabies and bovine TB. I was very grateful to be given an invitation to your meeting on 26th April. Indeed, I was also a little surprised as I did not think I would fulfil the criteria of being actively involved in TB research, having been retired for six years. On reflection I have decided not to come and feel I should briefly explain my position to you. The issue of badger culling to combat TB in cattle has become intensely politicised, to such an extent that the statements issued by Defra no longer have any scientific credibility and are merely crafted to underpin the Government’s policy position. You may be aware that I have already expressed my concerns on this to your predecessor – I can send you copies of our correspondence if you wish to see it. I felt strongly motivated to enter into this correspondence after having been involved in the AHVLA (formerly CSL, then FERA) research programme, directly related to the TB topic, for nearly the whole of my career. At the end of that correspondence it was clear to me that Sir Bob Watson was not a supporter of badger culling on scientific grounds, neither was Sir John Beddington who was initially involved in the exchange of views. The reason Rosie Woodroffe and I terminated the correspondence was because it became clear to us that the government was not going to be persuaded against its intention to mount the pilot culls, therefore we were simply wasting our time. The scientific arguments have been extremely well aired over the past few years since the RBCT was completed and reported on. In a way you could say that the science has become irrelevant – how else can one explain the Government’s dogged pursuit of a cull policy in the light of the publication of the open letter to the Minister, Owen Paterson, at the end of last year, with not one single independent scientist prepared to counter it, and the e-petition that led to a debate in Parliament resulting in an overwhelming defeat for the Government? What I can say with certainty is that if the cull goes ahead it will end in the most dreadful mess for farmers and Defra, not to mention this country’s hard pressed tax payers. I have personally done all I can to head this off but now feel it is a lost cause. There is a growing feeling that the Government has truly lost the plot on the issue. It is clear that the cattle/badger TB issue is no longer a debate about the veracity or implications of the science. The badger culling proposals are effectively an admission that government policy on TB control has become purely political. While it may be seen as a tactical advantage to give farmers what they want, i.e. a cull of badgers, I believe that this is will be a disastrous mistake, particularly for the farmers. To treat one of the country’s most iconic, indigenous species as some kind of political football is a grave error of judgement. Where would we go next? It is presumably no coincidence that the majority of the people invited to your meeting were signatories of the letter to Owen Paterson. In this respect the scientific case against culling will be well represented. You may say that I should carry on trying to promote the science by attending your meeting but I am concerned that Defra may seek to use this meeting as evidence of independent scientific support for the Government’s cull policy. As an example I would refer you to the meeting of the so-called Scientific Advisory Committee in April 2011. The recommendations of this Committee have been cleverly weaved into Defra’s defence of the current culling protocol, but not in a way that the scientists themselves would have wished. How can Lord Krebs’ statements, so strongly against the culling proposals, be reconciled with being one of those advisers? I have spoken to others who are similarly disillusioned. As you are aware, we scientists are a cautious, restrained bunch of people that work with facts and hold scientific integrity as our guiding principle; it seems politicians do not despite their claims for an evidence-based policy. One thing has become perfectly clear to me. The motivation for the pilot culls is purely political. Badger culling is being used as some kind of carrot to appease the NFU, perhaps to curry favour and gain support for more draconian measures. This is a highly risky strategy. I hope your meeting is a success and that real progress will be made in bringing a truly science led TB control policy back on track. However, I hope I have explained my personal views sufficiently for you to understand my reluctance to be there. The priority must be to stop this impending disaster for the farming industry and I will be continuing to assist the Badger Trust and other responsible organisations opposed to a badger cull to make this happen. Thank you again for inviting me. If at any time you feel I can offer any help in terms of working with you towards a truly sustainable long term solution, with badger culling permanently off the agenda, please let me know. Please feel free to share this letter with your colleagues and could I request that it is included with the record of your meeting. In October 2012, over 30 eminent scientists with considerable knowledge of wildlife and disease wrote to The Observer to explain why the Government’s proposed badger cull is very unlikely to work and risks making things worse. Dr Chris Cheeseman was among those scientists. Here he offers us a personal perspective and a deeper insight into the long-running bovine TB saga. It might sound a bit of a cliché to say that my involvement in the badger TB issue has been a long journey, but the subject has occupied most of my working life. This is my brief personal story with my conclusions from over 35 years of key related research. But before I start, I should reassure readers that I have no political axe to grind and no vested interest in any aspect of this issue. I am an active conservationist as well as a keen shooter. I have no connection with the farming industry or the veterinary profession, nor am I a member of any of the organisations that have grouped together under the umbrella Team Badger. My judgement is made purely on the scientific evidence and I am ready to provide my views to any who are interested. It was 1975 and I was a newly qualified post-doctoral student when I was offered the perfect opportunity to pursue my interest in wildlife management - a job investigating the role of badgers in the epidemiology of bovine TB. This was when the cattle TB problem was mainly focussed in certain parts of south-west England, with the Cotswolds being one of the worst “hot spots”. My first task was to select a suitable study area and I came across a valley called Woodchester Park near Stroud, Gloucestershire that fitted the bill. While establishing the Woodchester Park base for field studies, I honed my skills on surveying for badgers and their setts by helping to set up what became known as the Thornbury badger eradication exercise, where badger setts within 104 square kilometres between the M5, M4, River Severn and the Little Avon were gassed repeatedly with hydrogen cyanide for over six years. Gassing with hydrogen cyanide was eventually abandoned for welfare reasons. Our early work at Woodchester was undertaken by just myself and one other person. We concentrated on establishing basic ecological data for the local badger population. We made our own miniature radio transmitter collars for radio-tracking badgers, a new technology in those days, and bought some excellent ex-army image intensifying binoculars for night observation. Together with a local veterinary investigation officer, we also developed techniques for the live capture and clinical sampling of badgers to establish the presence, distribution and dynamics of TB infection in the badger population. After a few years a picture emerged of a stable, high-density, neatly organised badger community. Despite the presence of TB in badgers in this region, the disease at that time was absent from the local cattle herds. However, when TB was first discovered in a local group of badgers in 1976 this raised alarm with the Regional Veterinary Officer (RVO), who insisted on a cull of the entire social group. Shortly after that two cattle TB breakdowns occurred on farms in the study area and the RVO again insisted that all badger groups associated with these farms should be culled. As continued culling would have meant that we could not continue our research into TB, we negotiated a unique agreement with local farmers. In the event of a TB breakdown, farmers were given full compensation in return for leaving the badger population undisturbed to allow our scientific investigations into TB to continue. Meanwhile, outside our study area, an official culling policy was in place during the late 1970s through to the mid 1990s, where badgers were killed following TB outbreaks on farms where the local veterinary officers believed badgers were implicated. These were small-scale, reactive culling operations intended to remove just those badgers that might have been responsible for transmitting TB to cattle. It was at this time that we also became aware of the disruptive effects of culling. 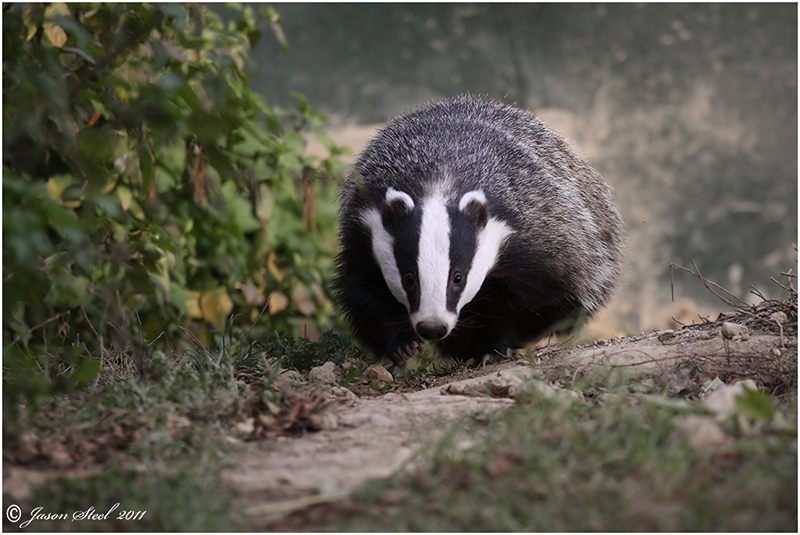 Badgers migrating into the culled areas ranged five times more widely and occupied many more setts than usual, offering greater opportunity for disease transmission. The disruption to the previously stable, well ordered spatial organisation of social groups also lasted for many years. Furthermore, fresh outbreaks of TB frequently occurred on farms neighbouring the original outbreak after the removal of badgers, which was odd and initially counter-intuitive. I can remember talking to some farmers who actually suggested that the policy was making things worse. ‘Perturbation’ was already a recognised phenomenon in wildlife disease control. For example, we knew that fox culling had actually accelerated the spread of rabies across Europe. To an ecologist, the observed disturbance to badger movements and behaviour caused by culling fitted this notion of perturbation. I floated the suggestion that culling could be counter-productive at a meeting with Government vets only to be told that it was “an unhelpful distraction”. Initial thoughts of switching career were swiftly dispelled by the challenge presented by this attitude. We therefore concentrated on building up a scientific understanding of how TB might be transmitted between cattle and badgers and vice-versa. While the evidence for perturbation mounted steadily, we still lacked empirical data to show what happens to the disease dynamics in cattle after badger culling. The breakthrough came with the appointment of a remarkably astute man, Nicolas Soames, who was then a Minister with DEFRA. During a visit to Woodchester, we explained to him the potential problems associated with badger culling, but also that the only way to measure the true effects of badger culling was through a rigorous, scientifically-designed trial. Mr Soames appointed Professor John Krebs, now Lord Krebs, to head a team of experts to undertake a review – the third review on the topic since TB was first discovered in badgers. Skip forward ten years, the time it took to complete the £50 million-plus Randomized Badger Culling Trial (RBCT). I received a phone call from Professor Rosie Woodroffe, the principle badger ecologist on the Krebs team and also a member of the Independent Scientific Group (ISG) appointed to oversee the trial. She was well familiar with the perturbation phenomenon through earlier collaborative work with us. She and the other ISG scientists had the foresight to structure and analyse the culling trial data to look for a perturbation effect. The reactive culling element of the trial had already been abandoned because it was clearly making cattle TB significantly worse. Proactive culling, where culling was carried out annually for five years in zones with a history of bovine TB, resulted in a small improvement in the core of the culled area, but with a similar scale worsening of cattle TB on the periphery. For the first time there was evidence that culling badgers can impact negatively on the disease in cattle. These results led the ISG to recommend that badger culling could make no meaningful contribution to the control of TB in cattle in Britain and the Government of the day sensibly abandoned it. Since the end of the trial the negative effects of culling have slowly waned while the positive effects have persisted for longer. This has led the present government to revisit the culling option, having made an election pledge that they would do so. They now estimate that the balance of the negative and positive effects will result in a meagre 12-16% relative reduction in TB in cattle on average, after culling for five years over large areas of at least 350 km2, but nine years on from the start of culling. It will be carried out over a period of six weeks rather than 12 days. DEFRA has argued that these changes will not be detrimental but they have no evidence to support this view. The costs are likely to exceed the benefits, indeed farmers have been warned that they will probably spend more than they can expect to save, even under the government’s most optimistic assumptions. Despite the fact that there is no scientific justification for a culling policy, the Government is pressing ahead with its pilot badger culls, which could start any time after 1st June 2013. As a scientist it is tempting to take a back seat and watch how things pan out. But I also have a conscience and cannot sit back and ignore the way politicians are treating one of this country’s most iconic, indigenous animals. Badgers are an important ‘key’ member of our native fauna and they deserve to be protected from the kind of persecution they have suffered in the past. Badger culling is simply not a sensible way to tackle TB in cattle. The Welsh Government has already dropped the culling option after taking independent scientific advice and is pursuing badger vaccination and cattle vaccination instead. The British public have expressed their strong opposition to culling through one of the fastest growing government e-petitions of all time, which went from less than 10,000 signatures to over 160,000 in the space of a few weeks and now (July 2013) stands at over 255,000. The government e-petition led to a debate in the House of Commons where the government was roundly defeated by a vote by MPs of 147 against the cull to 28 in favour. Many farmers and vets are calling for an alternative approach. The Conservative Party Bow Group has advised that culling should be abandoned. Killing badgers has all the makings of a public relations disaster for the farming industry. There have even been calls to boycott products from farms that participate in the badger cull that have caused consternation within the farming community. Yet still the Government ploughs on in pursuit of its cull policy. The planned cull is also a very poor use of taxpayers’ money as it will not contribute in any way to greater scientific understanding of the problem. There are no magic bullets, but the available evidence shows that badger culling should form no part of a cattle TB control programme. The only way forward is through more rigorous testing of cattle, better surveillance, improved biosecurity and fast-tracking the development and use of vaccines for both badgers and cattle. I send my appreciation to Dr Chris Cheeseman and Badgergate.org for permission to reproduce this article. Many thanks also to Steve Shepherd (BCfmradio.com) for his agreement that the radio interview could be available on B-R-A-V-E. If you are buying something online, easyfundraising will donate a percentage of your purchase to B-R-A-V-E without incurring extra costs.